This liquid is used in PCB manufacturing processes having 200 ML Ferric Chloride (PCB Etching Solution) & 3 Pcs of 18cm x 12cm Copper PCBs. 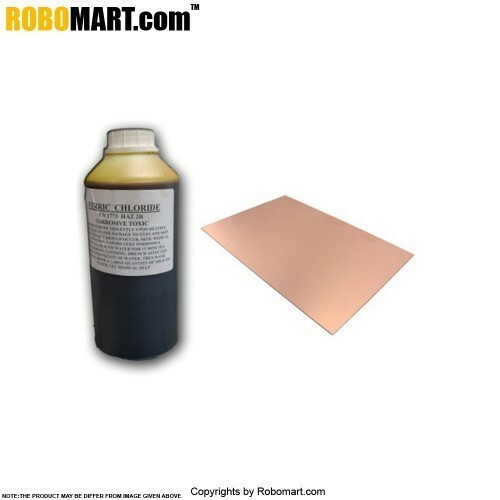 Ferric chloride (PCB etching solution) is used for etching the Copper Clad board. The circuit may be printed or made by permanent marker on PCB, this works well with both methods. Copper clad boards are of 18 cm x 12 cm size, which is perfect for all general projects. Copper boards may be easily cut into another size as required. It is used in PCB manufacturing. Also Searched as : PCB liquid, PCB etching solution.